Wash chicken wings under cold running water. Drain well. Place chicken wings in a clean bag and pour in marinade. Lightly squish the bag to coat chicken wings evenly. Leave to marinate for at least 2 hours. 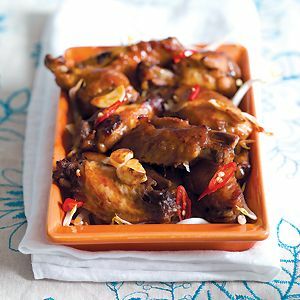 Line a baking tray with foil and arrange chicken wings over. Reserve leftover marinade sauce. Bake for about 25 minutes, until chicken wings are slightly charred on the outside. Pour leftover marinade over the wings and continue to bake for another 10 minutes, until chicken wings are crusty on the outside.